The German Bank of Wheeling started in business April 1, 1870 with a capital of $50,000. Officers of the newly formed bank were: Henry Schumulbach, president; C. W. Franzheim, vice-president; directors, Frederick Schenk, J. L. Straekheim, A. D. Seamon, L. J. Bayha. The first cashier, Oscar Gemmer, worked for the bank from 1870 to 1878. In July of 1896, The German Bank purchase the building known as the second Washington Hall, which also house and was commonly known as the Grand Opera House or Grand Theatre. The Hon. Gibson Lamb Cranmer wrote in the 1902 publication History of Wheeling City and Ohio County, West Virginia and Representative Citizens, "The business conducted on the corner of Twelfth and Market streets, a four-story building, 66 feet front on Market and extends to the alley. The building is of stone, the second floor is occupied by the Grand Opera House, the third and fourth floors are occupied by the National Telephone Company." The building was extensively remodeled in 1911 when an additional two floors were and Wheeling architect F. F. Faris designed a new neo-classical granite facade for the brick building. 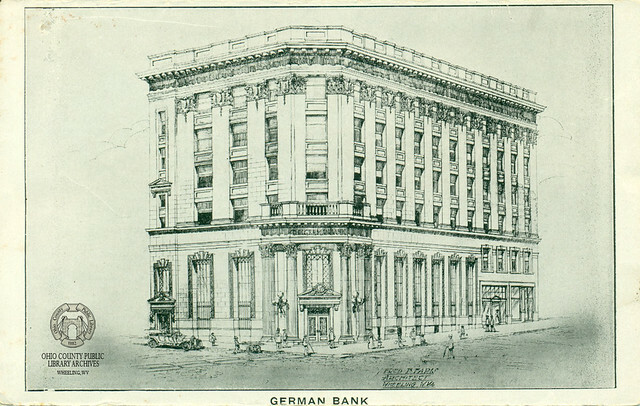 The German Bank of Wheeling was just one of many German businesses established in Wheeling following the wave of German emigration in the 19th century. Following World War I, many German businesses—wishing to distance themselves from the widespread anti-German sentiment prevalent in the days following the war—dropped their German associations, and in 1918, the German Bank of Wheeling became the Wheeling Bank & Trust Company (see advertisement in notes). In 1923, Wheeling Bank & Trust Company acquired the Bank of the Ohio Valley. A decade later, in 1933, Wheeling Bank & Trust merged with Dollar Savings & Trust to form the Wheeling Dollar Savings & Trust Company, the largest bank in West Virginia at the time, with assets exceeding $19 million. Wheeling Dollar Savings & Trust continued to acquire competitors, including Citizens Mutual (1939), National Exchange Bank (1949), and South Wheeling Bank and Trust (1964). In 1968, WesBanco was incorporated, and it became a bank holding company in 1976. The six-story German Bank building on the corner of 12th and Market Streets still stand and today it is called the Laconia Building. - photo taken by the Ohio County Public Library Archives, March 2016. Regarding the remodeling of the Grand Theatre: the highlighted text is from "Industrial World" (a trade Magazine published weekly in the interest of Iron, Steel, Coke and Allied Industries), 45th Year, No. 20, Monday, May 15, 1911, Pittsburgh, Pa.
Advertisement for the "Wheeling Bank & Trust Co." from the Wheeling Intelligencer, July 17, 1920. ▶ Vertical File: Wheeling Bank & Banking Historical, Wheeling Room, non-circulating, ask for access at the reference desk.